If you’ve invested a lot of money in outdoor furniture, or you are thinking about buying a new outdoor item, you should know how to maintain and care for it to ensure its longevity. Due to its location, outdoor furniture is more prone to deterioration. If you keep to a schedule and clean your furniture on a monthly basis, it helps maintain a good appearance and makes your furniture last a lot longer. You’ll find some lovely pieces of outdoor furniture made from wicker, to ensure you keep these items looking great, you must maintain them in the best way possible. Outdoor wicker furniture can be easily cleaned using a garden hose or pressure washer. All you have to do is remove the cushions and spray away excess dirt. There may be some stubborn stains on the furniture, so it is advisable to use warm water and soap to tackle these areas. Once the wicker has dried, you can apply a wax to the frame to protect the furniture, if your wicker isn’t water-resistant, you’ll need an added layer of protection. Metal furniture is very easy to care for and maintain, it is highly durable and simple to keep clean. Most types of outdoor metal furniture like wrought iron and aluminium can be cleaned using soap and water, they don’t require any special type of cleaning solution. Modern outdoor metal furniture is coated with a protective adhesive, this is designed to protect the material from rust and corrosion. 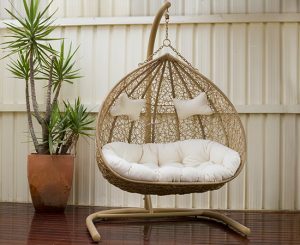 If you purchase outdoor furniture in Melbourne from a reputable supplier, the items should be rust-free and rust-resistant. If the metal isn’t, you’ll need to buy a wax adhesive from your local hardware store to protect the material. If you don’t take steps to protect the metal, it will start to corrode and lose its visual appeal. Corrosion can affect your furniture’s structural integrity, making it dangerous to use. This type of outdoor furniture does require a little extra attention, it isn’t as durable as other items on the market. Some types of cushions gather mildew, while others are mildew resistant, it all depends on where you buy your products. If you need to clean them, you’ll have to use bleach and solution to keep them looking new. Many homeowners forget that umbrellas need to be cleaned and maintained on a regular basis. Umbrellas are great for several reasons, they help to protect other outdoor furniture by providing cover from the sun during the hot summer months. If they’ve been in storage, they’ll need to be thoroughly cleaned once opened out. It is important to oil the joints and wash the cover using a soft-bristled brush. If you plan on looking after your outdoor furniture and keeping it looking great well into the future, you must clean and maintain each part. Outdoor furniture is a great investment, especially during the summer months when you can really enjoy the weather. If you fail to maintain your furniture, it will quickly degrade and lose its visual appeal.